Pluto and its largest moon Charon proved to be extremely interesting objects during the recent New Horizons flyby. While the spacecraft is on its way further into the Kuiper belt (hopefully to fly by another fascinating object in the foreseeable future), it keeps sending the flyby data home. What can it tell us about Pluto so far? I have interviewed Dr. Hauke Hussmann, planetary geophysics scientist from the German Aerospace Center (DLR), about Pluto and other objects of our solar system. Dr. Hussmann has published lots of studies especially on the icy moons of our system, including a 2006 model of the possibilities of subsurface water reservoirs. He is also the principal investigator for GALA, the laser altimeter aboard the planned JUICE spacecraft bound to map the three icy Galilean moons: Europa, Callisto, and especially Ganymede. The composite image of Pluto captured by New Horizons on July 14. Credit: NASA/JHUAPL/SwRI. The world is excited by the New Horizons’ images of Pluto and Charon. The terrain, especially on the so far seen Pluto images, seems very young, geologically active and some features may indicate cryovolcanism. Thoughts about the possibility of a subsurface ocean appear with increasing frequency. Your study from 2006 centers on modeling conditions under which such reservoirs of water could persist. Do you think that further data from New Horizons can put more constraints on the model’s application on Pluto and Charon, e.g. reveal significantly more about their past gravitational interactions, degree of differentiation, amount of ammonia or other characteristics? Regarding its surface, Pluto is showing a diversity of terrain types that is beyond all expectations. 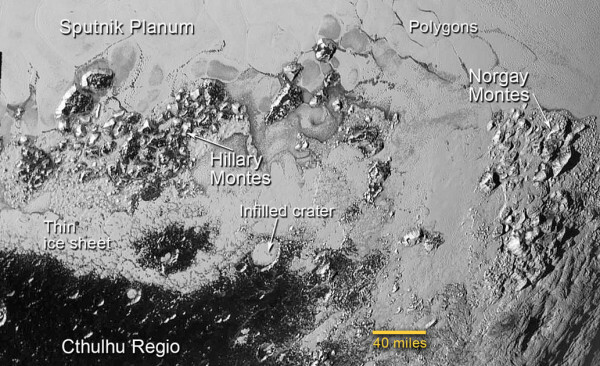 Some of these features require large amounts of energy and heat in Pluto’s interior. Therefore, the surface features, including e.g. flow patterns, mountains and troughs are telltale sign of a very eventful history. From the number of craters the relative ages of these features can be derived and the geological history of Pluto can be revealed. Although we can observe only the surface, the processes are linked to internal heat sources and Pluto’s internal evolution. Through tidal interaction it is even connected to the evolution of the Pluto-Charon system and models will tell us whether liquid water could persist in Pluto’s interior. Our 2006 models are much too simple in that sense. Now, with the data from New Horizons planetary scientists are able to go beyond these very generic models taking into account imaging and compositional data. Unfortunately, the degree of Pluto’s differentiation, an assumption in our 2006 models, cannot be well-constrained from the gravity field data of one flyby, but indirect evidence again might come from the analysis of imaging and compositional data. The latter is extremely important to constrain the melting temperature of the ices involved. Image of the southern region of the Sputnik Planum, showing some of the most interesting features of Pluto at once. Credit: NASA/JHUAPL/SwRI. One of the interpretations of the pattern of polygons seen in Pluto’s Sputnik Planum is convection in the icy crust. If this hypothesis is correct, would it mean that based on its extent, there probably is a subsurface ocean beneath, or would there be other as likely options? Even if we find clear evidence for convection in Pluto’s ice shell or in a specific region it would not directly tell us whether there is liquid water beneath the convecting cells. Convection in the ice shell requires temperature or compositional gradients that control the buoyancy of up- and down-wellings. It does not necessarily require temperatures that reach the melting point of the ices involved. The polygons have typical dimensions of about 20 km which would imply a relatively thin convecting layer, which is unlikely if we consider a global ocean. Due to the low surface temperatures I would expect a global ocean, if it is there, to be located beneath an icy crust of about 200 km thickness. Furthermore, there might be other explanations for the polygons, e.g. contraction of material that is exposed to the surface. In short, I think we should be careful with interpretations regarding liquid water at this stage. Pluto shows unique surface features and a lot of effort will be needed in the next months to reliably interpret the data. What surprised you most about the so far released data about Pluto? Is there anything you’d like to point out as most deserving a closer look? I was most surprised by the icy plains region ‘Sputnik Planum’ and by mountains as high as 3.5 km. As an additional aspect I did not expect the surface features to be so young (~100 Mio years). This stands in contrast to most of the icy satellites and puts Pluto into one group with Europa, Enceladus and Triton which all show signs of recent or ongoing activity at their surfaces. Many features deserve a closer look which is unfortunately impossible in the near future with New Horizons receding fast from the Pluto system. Pluto’s subsurface ocean may remain a highly uncertain possibility for a long time but for several objects of our solar system, the data is very strong, ranging from their surface geology, observed geysers to gravitational measurements or induced magnetic fields. Saturn’s moon Enceladus is one, but the last Cassini flybys are scheduled for this year, and future missions are uncertain. However, the Jovian system may become much better known to us thanks to JUICE, developed by ESA and planned to be launched in 2022. You’re the principal investigator for its laser altimeter GALA, which should be able to map surface topography of the icy Galilean moons in great detail. What are the biggest contributions this mission could bring? Is there anything you hope to find out most of all? With JUICE, which stands for Jupiter Icy Moons Explorer, we are going into orbit around Ganymede, the largest icy moon in the solar system. Because we are in orbit for several months we will obtain detailed measurements and excellent coverage with global and high-resolution data. For the first time we investigate the icy satellites with subsurface radar and laser altimetry combined with imaging, spectroscopy, magnetometer and gravity field measurements. The combination of instruments will reveal whether Ganymede has a subsurface ocean and at which depth it is located. We want to understand the processes that have shaped Ganymede’s surface (e.g. tectonism, cryo-volcanism) and how these are connected to dynamics in the shallow subsurface and deep interior. Also the question, whether Ganymede is active at present will be answered by this mission. Furthermore, with JUICE we investigate the unique interaction of Ganymede’s intrinsic magnetic field with Jupiter’s magnetosphere. Jupiter’s moon Callisto is considered something of a mystery due to its incomplete differentiation. What are the current leading hypotheses on its difference from other Galilean moons in this aspect and how would JUICE bring more light into this matter? How does Callisto shape our view of the dynamics of icy moons? During the Galileo mission Callisto has shown a strong signal of an induced magnetic field which is interpreted as evidence for a subsurface water ocean. On the other hand the gravity field measurements tell us that Callisto has not completely separated the ice from the rock. This is difficult to understand in terms of a complete evolution scenario. With Galileo it was only possible to obtain gravity field data in equatorial flybys. With JUICE we will have the opportunity for several flybys including inclined and polar flybys which will greatly improve the gravity field data which is the basis for refined interior structure models. The process of differentiation on Callisto seems to be very slow. With JUICE we will have the chance to capture different stages of icy satellite evolution comparing Europa, Ganymede and Callisto. Comparing the impact rates on Ganymede and Callisto we can assess whether different energy rates provided by impacts could be the reason for triggering differentiation at Ganymede and not on Callisto. This is one hypothesis. An alternative would be the different orbital evolution and tidal heating of Ganymede. This year is remarkable in the number of scientific contributions from many parts of our solar system, ranging from Pluto, Saturn or Ceres to Mars or the Churyumov-Gerasimenko comet. Can we even as early as now deduce any new insights on the evolution of our system (e.g. the distribution of elements and their isotopes in the primordial accretion disc, planet migrations…) from their overview? In what ways could we reliably combine the knowledge from these sources to gain a greater understanding of the solar system as a whole? What planned observations are you awaiting most? Comets, asteroids and Trans-Neptunian Objects tell us a lot about the early stages of solar system evolution. Isotopic abundances and composition of ices and other materials in general provide insight in the distribution and mixing of compounds at the beginning of the solar system. 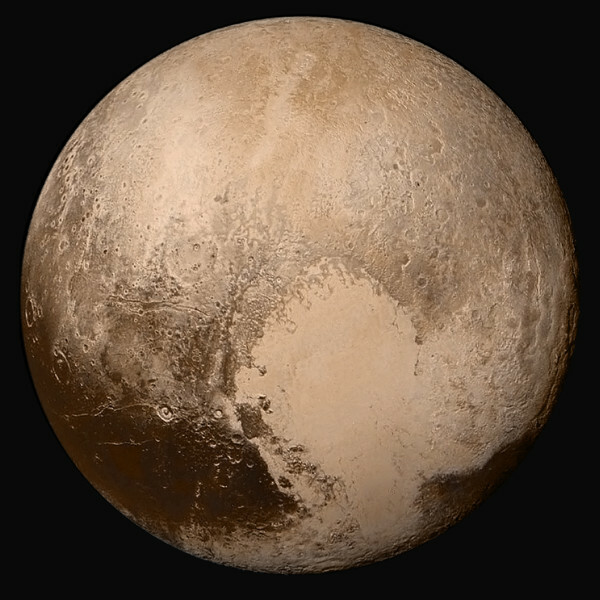 Here, I am looking forward to detailed analyses of the surface composition of Pluto and also Charon. From the volatile ices incorporated in Pluto and Charon the conditions (temperature and pressure) during formation of the Pluto-Charon system can be constrained. It will be interesting to see the differences between Pluto and Charon to better understand the local environment in which they have formed, but also to compare the Pluto-Charon system to the icy satellites and to compare the region of the giant planets to the more distant Trans-Neptunian region in terms of volatile abundancies. Regarding ongoing mission and measurements I am most curious whether Philae, the Rosetta lander, will become fully operational again while the comet is approaching the sun. Taking further in-situ measurements at the cometary surface would be huge success, technically and scientifically. On larger scales it will be interesting to see what New Horizons has in store when it is approaching another Kuiper-Belt Object in the coming years. Is there any object in our system you’d like to see studied in more detail, or any proposed mission concept you would want most to see realized? What should be our objectives regarding planetary science for the next few decades, in your opinion? The interview had been conducted in late July and the Czech translation was published on the popular science portal Nedd.cz on July 31.